Rain and cold is back again with the wind. Where is Spring? Two days of sunshine and five days of rain, cold and wind. Great day to stay indoors with a cuppa of chai and craft. That was exactly what I did today. Hello everyone, welcome back to my blog. Today was such a productive day that I made a set of 10 Christmas cards (design #2) and this card using Altenew’s new Gilded Ombre washi tape. These large or should I say wide washi tapes from Altenew are just so beautiful. I bought the Gilded Ombre, Galaxy Washi and Watercolor Nebula tapes from the latest release. I was drawn to the Gilded Ombre tape and decided to play with it. The purple is gorgeous but the gold vein take the cake. The challenge was to showcase the tape as much as I could on the card. So I adhered the tape diagonally across the white panel. This panel is 3.75″x 5.50″ in size. I adhered gold foil strip of cardstock on left end of the panel. This gold strip ties in with the gold vein on the tape. 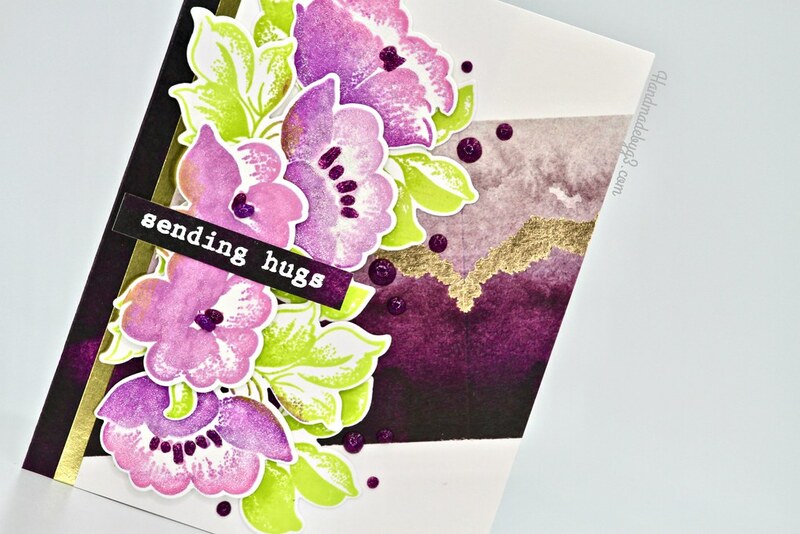 To complement the purple ombre, I stamped the florals and leaves from Frosted Garden stamp set using the Shades of Purple ink set and Bamboo and Parrot inks form Tropical Forest ink set. They were die cut using the coordinating die and adhered using glue and foam adhesives to make a large cluster on the left of the panel. 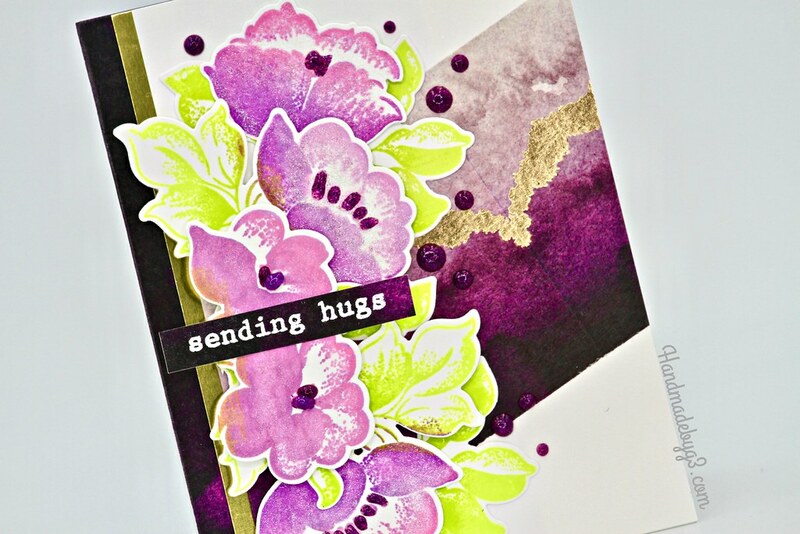 To bring the purple from the Gilded Ombre tape to the left side of the card front, I adhered the tape on the card front on the card base with the dark purple showing on the extreme left side. Then I adhered the floral panel on the right side of the card front using glue. For the sentiment, I used a scrap piece of paper to adhere the Gilded Ombre Tape and white heat embossed the sentiment from the Frosted garden stamp set. Then trimmed the sentiment and adhered as shown. 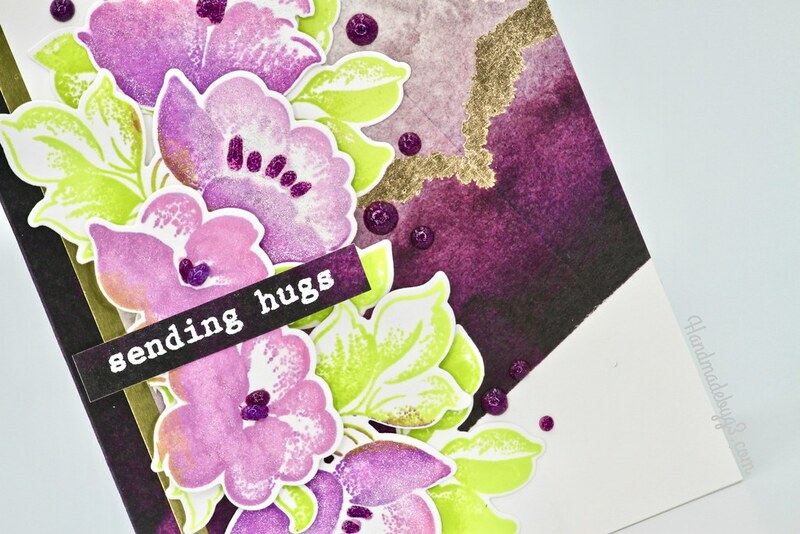 I finally added clear shimmer to the flowers and Lilac Whisper Nuvo glitter drop to bring the whole card together. Once the card was completed, I was so happy to see with the colours and the layout of the card. It turned out quite well. The complementary colours of purple and green are gorgeous along with gold. After working on a few blue coloured cards over couple of days, all the rich purple colours were beautiful to the eyes. I have listed all the products I used to make this card below for your convenience. It is wonderful that you took time to visit my blog today. Appreciate your visit very much. Have a lovely day at our end. Beautiful! That washi tape is simply stunning! Love!